One key to getting close is varying your pitch height via the toe of your wedge. Are you a one-trick pony when it comes to pitching trajectory? If so, you're severely limited when you have to fly the ball to the back of the green or hit something extra soft. The good news? A simple backswing adjustment helps you pitch the ball high or low so you can easily handle almost any kind of greenside scenario. Here's how it works. Play the ball back in your stance, opposite your right instep, and make sure the handle is pointing to the center of your body (i.e., your sternum). 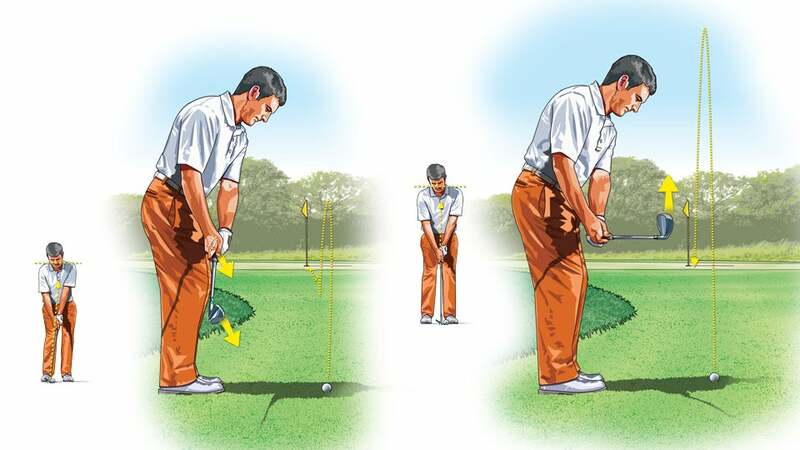 There should be a slight forward lean to the shaft and your shoulders should be relatively level. As you swing the club back, keep the clubface closed by pointing the toe of the clubhead and your right palm down at the ground. This will take loft off your wedge, producing a lower trajectory shot that scoots along the ground. Turn your body and the club at the same pace to ensure solid contact. For the high pitch, play the ball a bit forward of center in your stance, which will position the shaft more vertically. Again, the handle should point to your sternum and your shoulders should be level. On the backswing, hinge your wrists up toward your right shoulder, which rotates both your right palm and the clubface open so that the toe points toward the sky. This adds more loft and gives you added height to stop the ball close to the hole.